And on Thor’s Day, we celebrated the First Thanksgiving. Just imagine Issy sitting at the table instead of taking the picture. 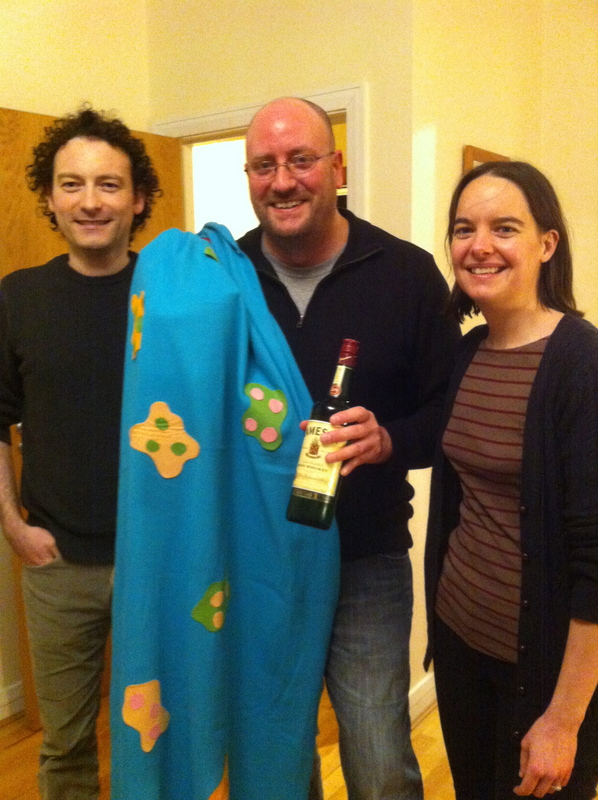 There is no Thanksgiving in Ireland. Nor in most of Europe, from what I can gather. It is not a uniquely American holiday, but there is certainly something very American about Thanksgiving. Its origins lie in that old chestnut about the Pilgrims and the Indians sitting down together to celebrate being best buds, but we all know that it’s a lot more complicated than that. But no one wants to dwell on the ill-treatment of the Native Americans by our ancestors, so….HEY! FOOTBALL! These are all the standard traditions and ideas of Thanksgiving that everyone mentions in Articles About Thanksgiving, so I won’t try to analyze it any more, because I’m trying to write something unique about the holiday. 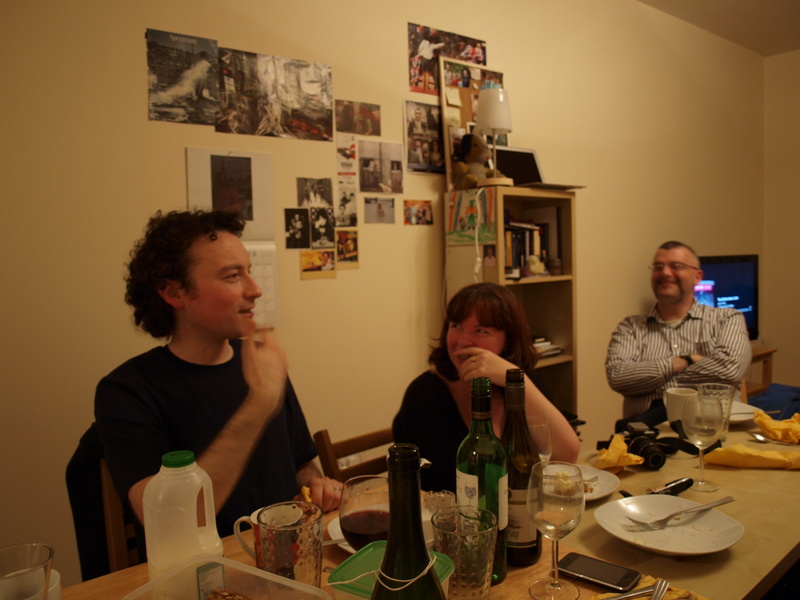 And this is the interesting part: I gathered together my Irish, English, and Italian gang of friends to celebrate a proper American Thanksgiving, hoping some new insight would be gleaned from their experience as First Timers, but it just confirmed everything that’s already been said about the holiday. Eat too much? Check. 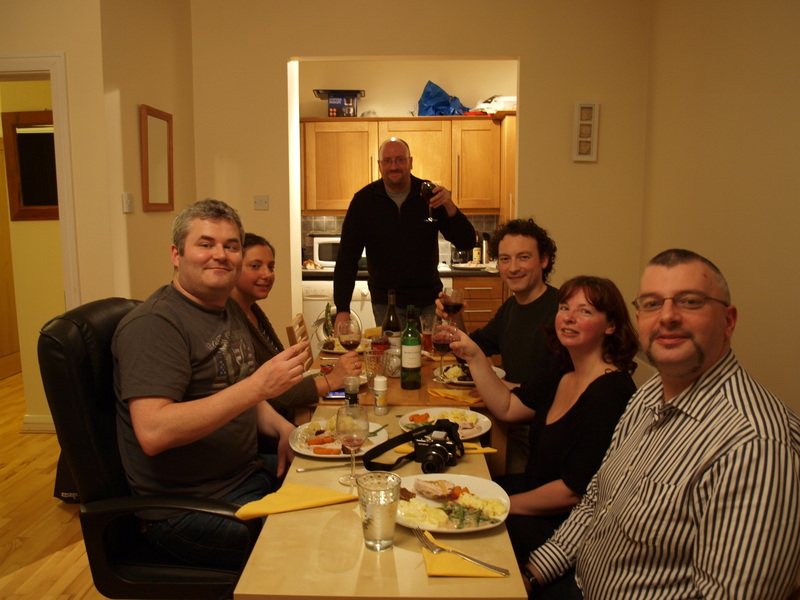 Everyone brought food, and we tried a bit of everything during the three-course meal. (Well, except for the vegetarians.) They all had to go to work the next day, and everyone still seems to be stuffed from the night before, according to their Facebook status updates. Marvel at the strange foods? Check. I made green bean casserole for them, which they found bizarre before even seeing it. When I took it out of the oven, I was puzzled by how runny it was, and then we realized that over here, their cream of mushroom soup cans aren’t condensed. So no proper thick, gooey, delicious casserole for us, but it was still somewhat edible. 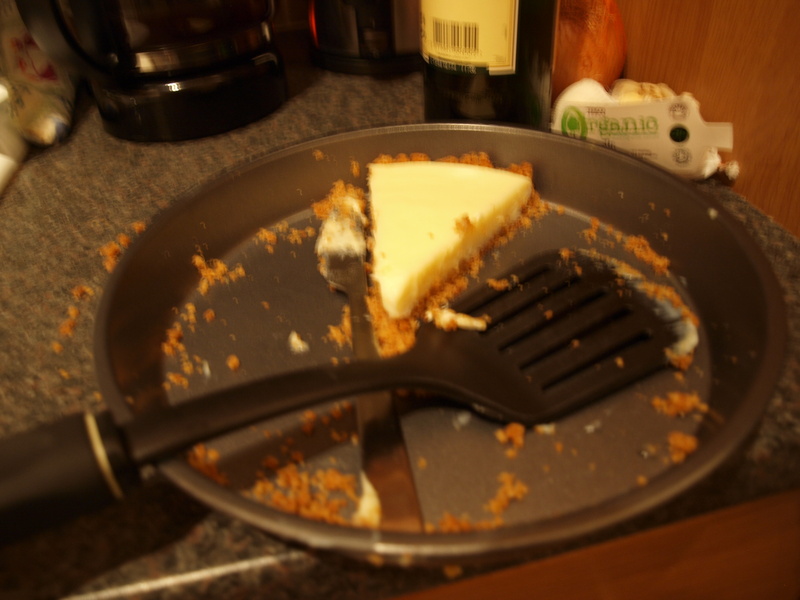 The last of the sort-of Key Lime pie. The foods I did get right were Grandma’s cranberry relish, which is served cold, as a nice palate-cleanser. I also made a variation on what we call an “Eagle Brand” pie, which is basically a Key Lime pie, made from graham cracker crust and condensed milk, but is also very, very delicious. And incredibly sweet. I think I gave everyone at the table diabetes last night. 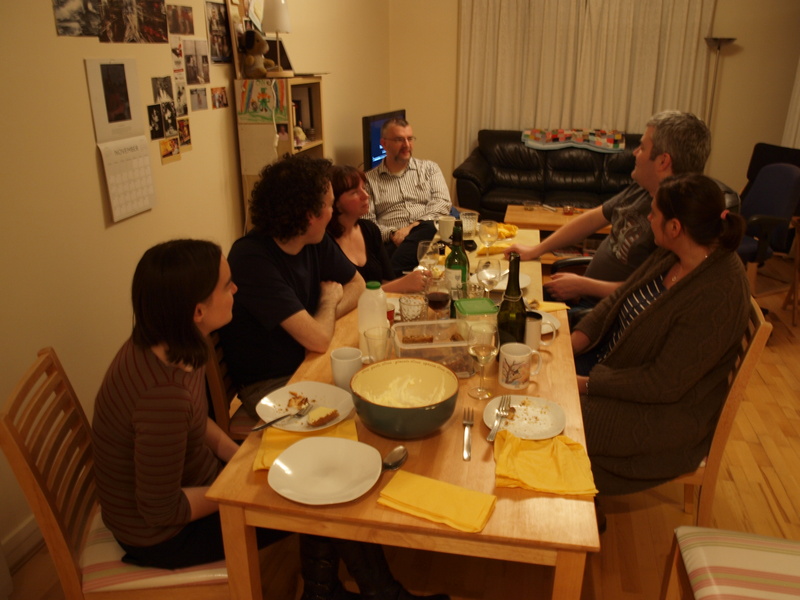 It was all very typical, but at the same time it was one of the best Thanksgivings I’ve ever had. For my entire life, I’ve been an attendant at Thanksgiving, and the other big holiday gatherings like Christmas and Easter. I’m the Bachelor Uncle Guy with the Small Townhouse who doesn’t have to host, or make any food, doesn’t have any signature dishes, just bring a little wine, make a few jokes, then get cranky/lonely/sleepy. It can be rough for the personality when you’re a permanent guest at life’s major celebrations. But thankfully, for once, last night, I was able to be the host. I got to invite people into my home, carve the turkey, pour the wine, and make the toast. This was Thanksgiving on my terms, and it was an incredible experience. I don’t mean to come across as selfish or arrogant, mind you. (I’m looking at those previous sentences, with all of the “I”s and “my”s, like I’m a toddler who won’t let anyone else play with the blocks.) My students and actors may be used to seeing me as the Man with the Plan, but in the real world, more often than not I’m just shuffling along, riding in the passenger side of life. It’s what happens when you remain a single guy living within 25 miles of your hometown. You don’t get the chance to create your own traditions. 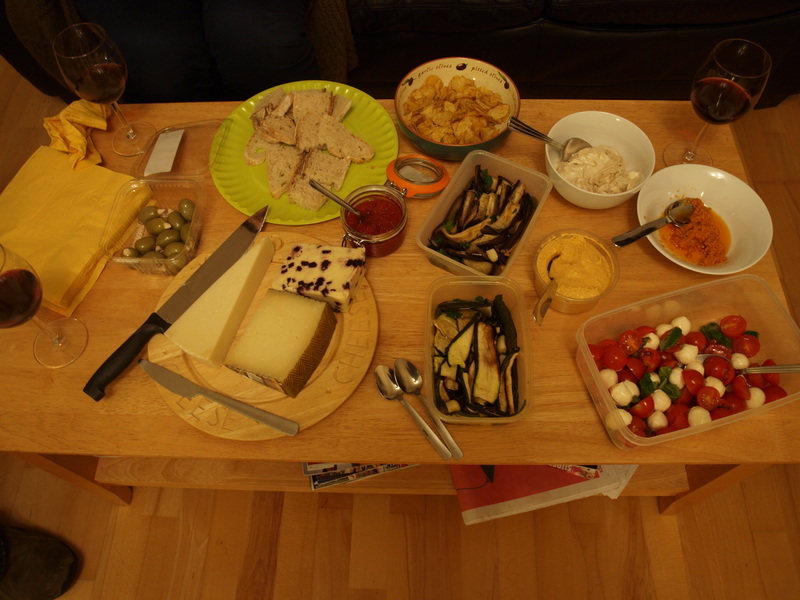 I was short on cutlery, had barely enough wine glasses, no proper serving spoons, and we Frankensteined my dining table and my small desk together for the feasting. Linus sat in an office chair and questioned the thick slices of turkey I had carved. (Not sure if I carved them too thick, or if they carve turkey really thin over here.) And I played good American music like Wilco and June Carter Cash and John Prine. Through the miracle of modern technology we were able to have my family “join us” from Sandwich for a few minutes, and my two worlds briefly became one. And while I haven’t talked about my family too much on this site, I hope they know that I missed them greatly, and I tried to honor them in my own small efforts, with relish and Eagle Brand pie. And I thought about them often. But for now, I am here, and it is important to stay focused on the here, instead of the “back home.” I’ll be back there soon enough, but I need to enjoy every single moment I can of living in Ireland, because it ain’t gonna last forever. It’s been an incredible journey, in many ways, and for the experiences I’ve had, and the people I’ve shared them with, I am especially grateful on this Thanksgiving Day. 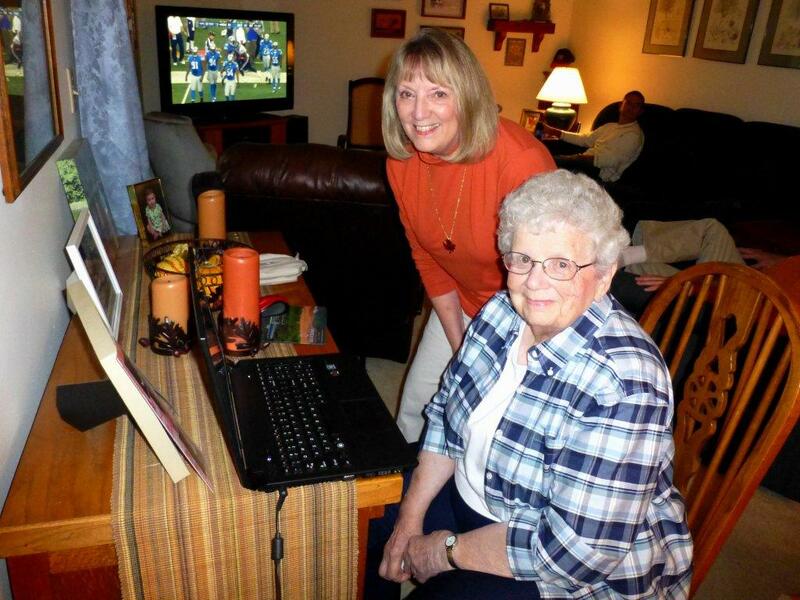 A view from the other side: Mom and Grandma talking to us via Skype. On Sun’s Day, it was the beginning of the end. The semester ends in two weeks. November 30th is the last day of class, where I get to present a six-minute movement piece starring myself. Yesterday I finally got a clear idea of what to do with it, but it’s still been the assignment that I dread, and that I just want done. Hopefully it makes sense. There’s a nice bit of metatext (as we call it in the academic biz) where the piece’s theme is about a student pushing against the constraints of traditional schooling. Take that for what you will. Today I did as I normally do on a Sunday: sleep late and read the news before getting on with my day. 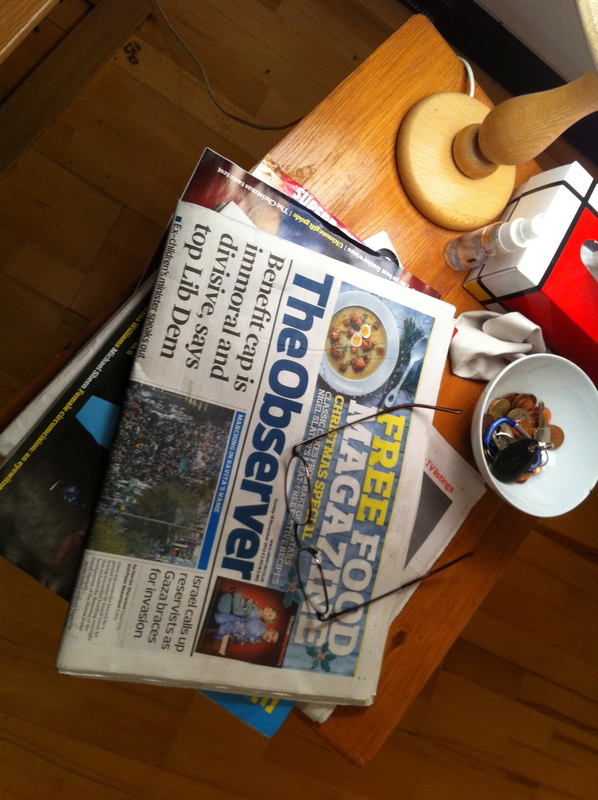 I usually buy a Sunday Observer and read that throughout the week, as I’m always being pulled back to my assignments. I think the quality of the newspapers is going to be one of the things I will miss the most, once I leave here. Ours have been gutted and trimmed back, but over here they’re still stuffed with great writing and lengthy articles. And as usual, I had a hearty breakfast and helped further clog my arteries with Superquinn’s award-winning sausages. 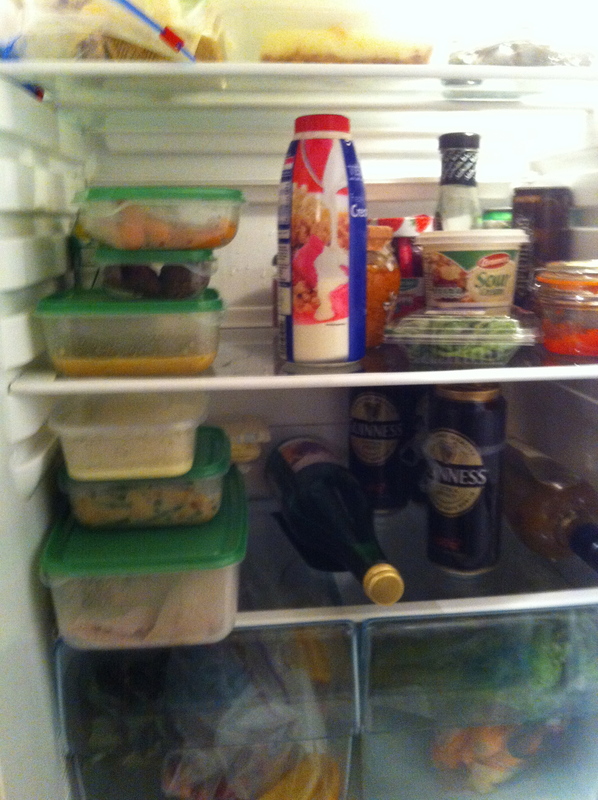 The eggs from Tesco come in this lovely bright green carton that I never get tired of seeing in my fridge. Seriously, how can you not enjoy looking at something like that? It’s almost a shame to crack ’em open. 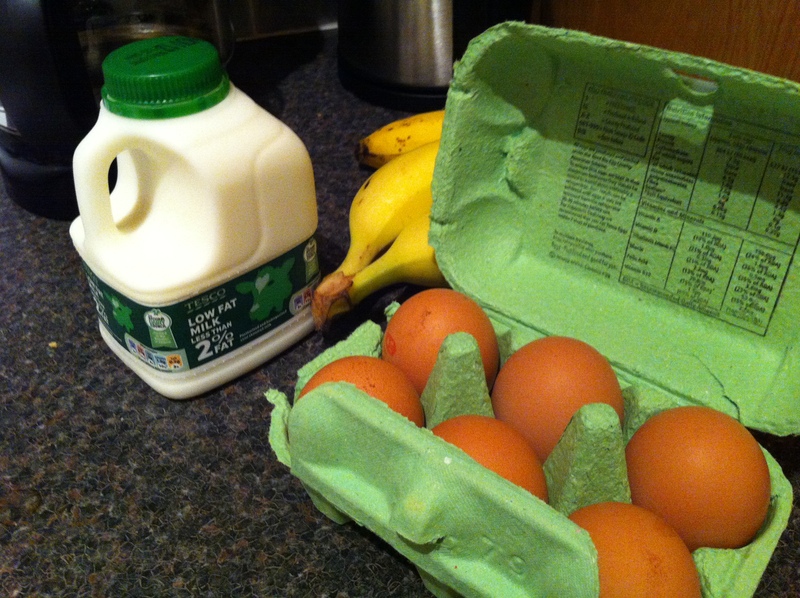 Free-range eggs from Tesco’s, with mini-milk jug! I cleaned up the place a bit, organizing some of the receipts and little bits that had collected on my desk and coffee table. I found my used train ticket from last month’s trip up north, and instead of throwing it away I tossed it into my desk. 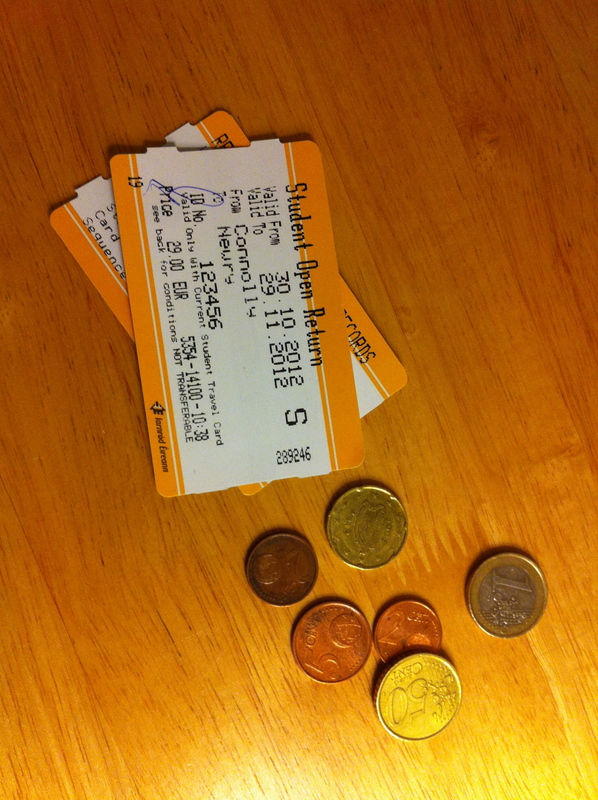 I can never throw away train tickets. If you’re lucky, the train ride itself can be as much fun as the place you’re traveling to, and it’s yet another one of those little objects that are unique to being “over here.” I miss having a car sometimes, but I never, ever get tired of taking a train somewhere, even if it’s just out to my friends’ place in the northern suburbs of Dublin. I threw a load of laundry into my tiny washing machine and walked into the village to buy a few groceries. Talked to the butcher about a turkey breast for Thursday, and as I left the clerk, a young Polish girl, smiled and wished me a Happy Thanksgiving. It made me happier than I could properly describe. 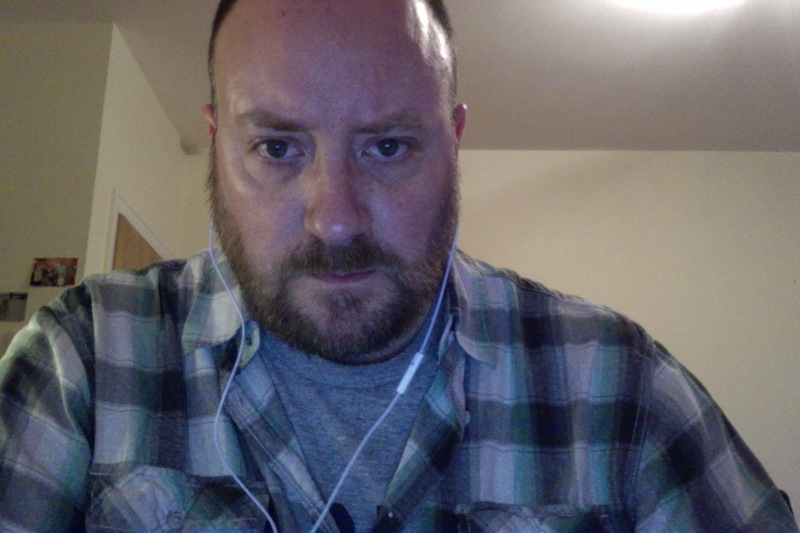 The afternoon and early evening were spent writing another scene for a short play I’m writing for another class. While I grumble about the movement piece, and privately express some severe frustration with some of the other classes I’m taking, I’ve been rejuvenated by the one class I wasn’t expecting to take. (Remember, I’m auditing the course.) It probably helps that I’m not writing on a deadline, or that I’m trying to write for young actors. I’m free to put down whatever I want, and so far it’s going well. We’ll see where it winds up. If my computer had eyes, it would see THIS for several hours every day.